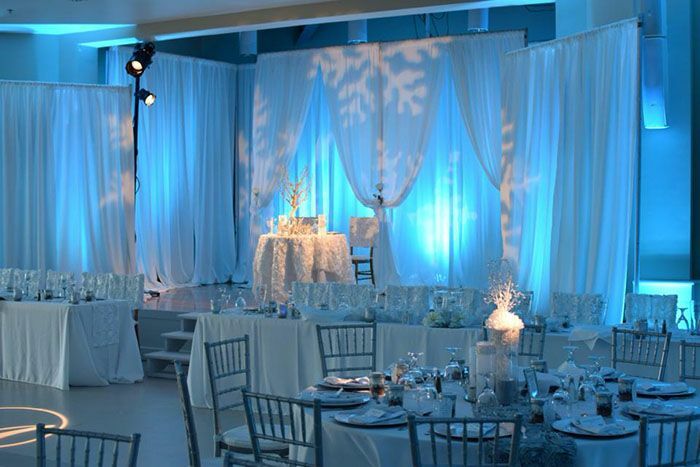 Pipe and Drape is an extremely versatile decorating tool. It can be used to hang lights, streamers, and banners, but the most popular are drapes. 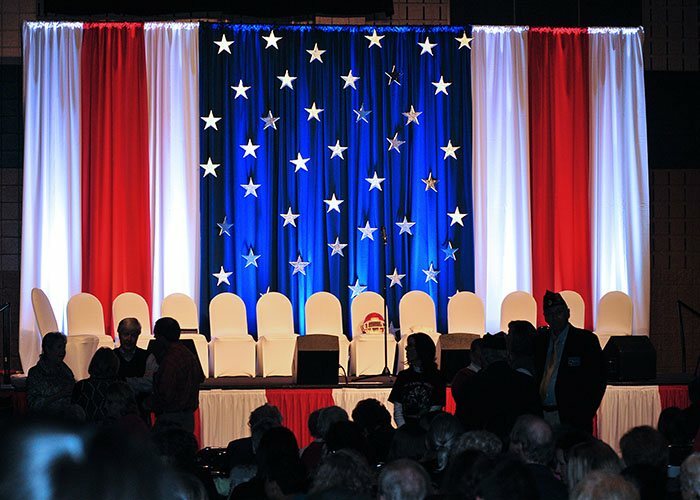 Drapes are ultra-functional, providing a temporary back drop, masking or dividing of an event space while also looking nice. Depending on your application for Pipe and Drape there are several popular choices for the best fabric to use,below are our top picks. If you’d like to speak to an expert call us (770-447-4339),we’d be happy to strategize which fabric is best for your business. This is the most versatile type of drape. It has a flat, matte finish, which makes it great for up lighting and photography. It comes in a 60in or 120in widths and can be sewn to any height. It has a reasonable, mid-ranged price – making it perfect for all events, from weddings to corporate. Banjo Drape is extremely popular because of its wide range of available colors (27!). It has a weaved texture with high sheen. 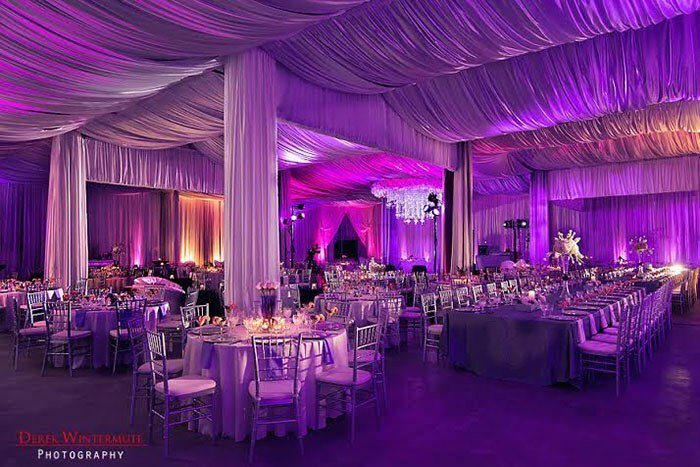 It has traditionally been the standard trade show fabric for over 30 years but more recently it’s gaining popularity in the wedding and event market due to its shiny finish that up-lights beautifully.This paired with it being one of the most affordable fabric options for Pipe and Drape, Banjo is our number two pick and a great foundation drape if you are just starting out in Pipe and Drape. This type of fabric is translucent, lightweight,easy to work with, and store. It provides romantic, flowy layers and looks beautiful when up-lighted. It’s often used in layers to create unique and elegant design looks. 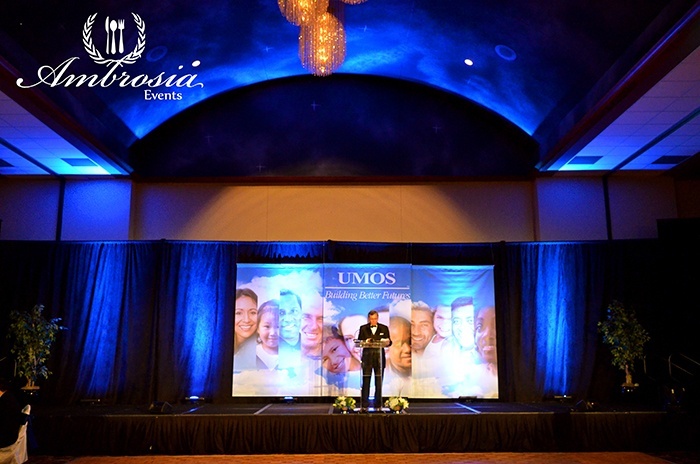 Poly knit drape is the most up and coming type of fabric as it gains popularity with event designers. They love it because of the high sheen for up-lighting or looking smooth and silky. It’s lightweight and easy to work with and is available in a wide array of colors and comes in 60″ panels or 120″ panels. This fabric is a lightweight velour, with the look, feel and attributes of an expensive velour. This is how you get high-end without the price tag. It is plush, 100% black out and washable. Available in 5ft wide panels or 15ft panel wide.